A mere three sonatas appeared in print in Schubert's lifetime. Others out of his musical bequest were published a few years after his death by friends and were given posthumous opus numbers. One of these was the monumental Sonata B flat major D 960 which was the last of the posthumous sonatas and as such Schubert's last instrumental composition of all. 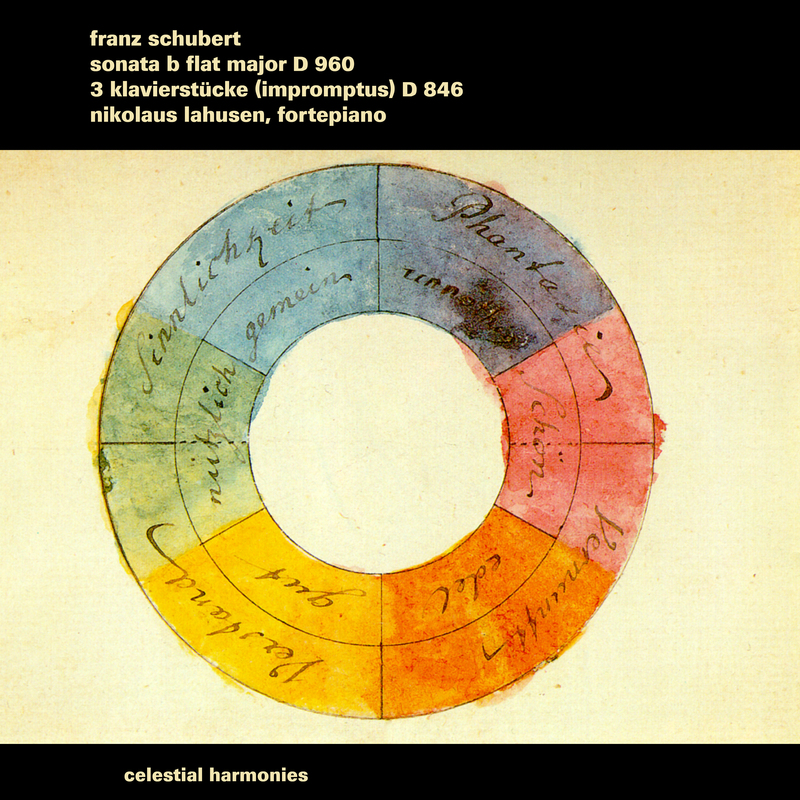 Schubert made an essential contribution to the piano music of the Romantic period not only with his sonatas but also with his cycles of piano pieces. The Three Piano Pieces D 946 are works of such an intimate, confessional nature emerging in the last year before his death; character pieces which gained increasing popularity in the first three decades of the 19th century at a time when his piano sonatas had begun to lose some of their initial favor with the public. An original Conrad Graf Hammerflügel from the Dutch collection of Edwin Beunk was played by Nikolaus Lahusen on this recording. Built in 1835, this instrument is the like of which would have been played in Schubert's day. The Graf piano is heard on this recording for the first time on CD. “Then at the age of 14 came the upheaval of the move to Germany, a country foreign to me, which forced me to leave behind my friends (and first girlfriends). When, after two months, the container arrived from Mexico and the grand piano was unpacked, it’s hard for anyone to imagine what this meant to me: my salvation! From that day on the piano and music became my greatest pleasures and friends. I spent every available opportunity at the piano where I found everything that was lacking in an alien environment and in which I found someone to tell all my troubles and sadness but also my joy. My loneliness had discovered a partner! This intimate relationship has remained to the present day and has moved mountains: my youth was not one as a child prodigy, nor did I have ambitious parents who “directed” me toward music at a young age. In fact I began to play the piano late, was a happy child, and plunged into piano-playing with gusto at the age of 14, leading me on a path that has been paved with joy and enthusiasm. “I suspect that the feeling of belonging to two such different cultures led to a sense of homelessness which at the same time gave me a free and open-minded view of the world from which I’ve constantly profited in my musical career: many of the “experiments” I’ve indulged in en route can be attributed to that approach to life. When playing Schubert on a Hammerflügel or exploring the world of Ciurlionis or the Orff-Schulwerk, I need to learn something akin to a new language in each case. Such challenges are a decisive factor in my perception of myself as a musician, and it is to them that I owe many unique moments of my career. “This recording has a very personal note for me: in 1998 I became seriously ill. I had to cancel my concerts until further notice, and deliver myself instead into the hands of top doctors. The proximity to death, the experience of extreme situations but also the joy of being allowed to go on living are dimensions that have deeply influenced my life. And here again the piano became my best therapist. I found Schubert’s world of music extremely therapeutic, and indeed still do: when I start playing these works, I immerse myself into a deeper inner world, experience a whole range of feelings and afterwards emerge a cleansed, released and liberated person." Sonata B Dur / B Flat Major D 960 43'18"
7 Allegro ma non troppo 8'44"